GRAND RAPIDS, Mich. (WZZM) -- Musicians, comedians, dancers and more will compete Saturday night at the Peter Wege Theatre at the Grand Rapids Ballet Co. for chance to at a $1,000 grand prize. The event will showcase 16 finalists performing for a live audience and celebrity judges including "Gravy" from 105.3 HOT-FM, Steve Zaagman from WZZM-TV and others. Todd Chance of MLive is the emcee. The grand prize is $1,000. One finalist also will be chosen to perform at the 105.3 HOT-FM New Year's Eve party in downtown Grand Rapids. Doors open at 5 p.m. Tickets are $10 in advance at grsbigtalent.com or $15 at the door. Peter Wege Theatre is located at at 341 Ellsworth Ave. SW.
GRAND RAPIDS, Mich. (WZZM) -- In this Weekend Adventure, our weekend morning news team ventured to Grand Rapids Coffee Roasters. Grand Rapids Coffee Roasters is a wholesale coffee roasting shop. Every Saturday from 10 a.m. - 3:00 p.m., they open their doors for "The Saturday Experience". "We invite the public to come in and sample coffees at no charge and learn about coffee, answer their questions about coffee and if they care to, we'll take any of our raw beans and roast them to order while they wait" said owner, Craig Patterson. "No one else does that in town. We're all about education so we'll have three different coffees and three different roasts every Saturday. What we're trying to do is educate the customer on how the roast affects the flavor of the coffee. " The Saturday Experience also includes espresso shots & Americano's. GRAND RAPIDS, Mich. (WZZM) -- Grand Rapids bus driver Alicia Miller pleaded guilty to assault and battery for fighting with a teenager. Fluellen will be charged in juvenile court for her part in the fight. GRANDVILLE, Mich. (WZZM) -- Hot bands, live music and all to help the hungry. Gravy, from 105.3 Hot FM joined us in studio to talk about the "Pass the Gravy" food drive. Patrons are asked to bring a non-perishable food items with them to the event as this will serve as their admission ticket into the concert. Performers include pop artist Daya, who will be performing her pop hit "Hide Away". Also performing is pop duo Tryon and Grand Rapids very own The Outer Vibe. It happens on Saturday, November 7th at The Intersection, 133 Grandville Ave SW in Grand Rapids. GRAND RAPIDS, Mich. (WZZM) -- Halloween is the "spookiest" day of the year and if you're into creatures that "creep and crawl", Saturday's your chance to see them up close and personal. Daniel Garvin from D & E reptiles joined us with some special friends. 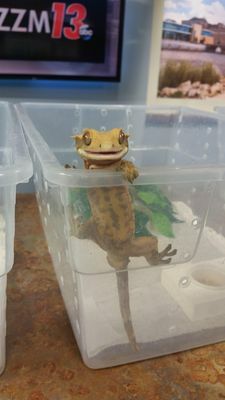 If you'd like to meet these guys in person, you can visit Daniel at the Grand Rapids Reptile and Exotic Pet Expo.